Seat/Chair, Bella, And 3 Emus ..
this starts with me, at a servic station, getting fuel for my car. and thats a bit odd in itself, because i'm parked at the servo, and yet, i have a seat, which is my car. the seat is one of those cushioned ones with the backrest back a little bit and has no arm rests. my car is at one of the bowsers, but i don't fill up the car with fuel. the servo would have to be caltex; thats because i don't go other servo companies, unless the caltex is too far away. i get off my seat/out of my car, to my right and step around to my left. then i see that i'm in the shop of the servo, to pay for the fuel, with my direct debit card. the woman at the counter, asks me about my account. i'm using the card of my less favoured account, and not of the favoured account. the woman doesn't know that, but i do. she seems to know about my favoured account. thats because she asks me "who is the lucky lady?" i don't say so, but the lady isn't "lucky". then i try to leave the servo. i get in my car/sit on the seat. initially my legs go up out of the door, as though i'm hanging my legs out of my car, from the passenger side. to drive or leave like that, would be rather awkward and uncomfortable. then i grab the front of the seat with my right hand, and then stand up as best as i can. i have to walk my seat out. then i turn left and walk the seat out, along hilton street, towards lydia street (in goonoo goonoo town). i can only see the ground/bitumen under as i look at the ground while walking the seat/driving the car. i thought a woman approached me, walking to me, head on, but i'm not sure of that. maybe she did approach me, but i couldn't look up at her cos i'm holding the seat and am going somewhere. and she may've had her young son with her. next, i'm reclining on the grass, in the backyard, of the old westdale house (still in goonoo goonoo town). i'm reclining on my left arm. the rear of the house is behind me. the hills hoist clothes line is to my left, about one, maybe two metres from me. dad is to my left, and reclining on his right. its either sunset, or the evening has just started. dad is about one metre from me, or even in line with the clothes line. young bella, from church, is sitting against me, with her back to my abs. i'm not quite side on, on my left, and i'm not quite on my back. my right arm is wrapped around her waist, and my right hand is on her abs as well. she is sitting up, with a slight slouch. gee, her abs are good. i see her side on, left side. her knees could be up, so legs not crossed. without looking at me, bella asks me am i unemployed. i say that yes i am; well i have been since feb '16. she wants to know am i doing anything on or for june or july 21.
i think i have her clarify which month, because they sound similar with the "ju" and she isn't looking at me when she says which month. she definitely does say 21.
i ask her why, about month. bella has a friend in melbourne, or her friend has a place in melbourne that bella can stay at, for a holiday. bella wants to go for a holiday, and stay at the place. she wants me to go with her, or would like me to. bella reckons i'm "boyfriend material". regardless of me being "boyfriend material" i think i agree to go. we are now both in a rural nsw area. i don't know where exactly, and, well, i don't really care either. we are standing on a raised mound of dirt, where an old disused rail line was. the rail line has been removed, which was done so a long time ago. the track exists, but not the actual metal rails of the track itself. initially, bella and i walk together. going west, is known, or, its a guess. we take a few steps in front of us, and then she gets ahead of me. she doesn't tell me she is going ahead of me. she just goes ahead of me. actually, i lose sight of her. i can make my way home, or to the nearest main road, or town. i keep walking and come across two emus. the time must be nearing evening, as i can only just see the faces of the emus. well, i'm now in front of them. i walk past them to get in front of them, which i do slowly. they are a tad taller than me. one of them, as i go past, pecks me on the left shoulder. and yes, i did feel the peck. so i walk backwards, while looking at them. then i slap one of them or both of them, on the nose, like that of slapping a naughty child on the hand. i need to keep the emus away from me. and another peck, on the hand. i do the one thing, that i probably shouldn't do, and of course, probably won't work for me. i know it won't work because emus are probably slightly faster than me. i'm not a slow runner, but i'm not fast, and i haven't been running for a long time. well, it turns out that running, is not really a good idea. well, i run or jog backwards instead of running away from them. while jogging, i slap the two emus on the nose. do they not get it? then a third one arrives. i slap each bird on the beak, for them to get away from me. not only are the emus are marginally closer to me, their heads are now bigger. their heads, well their skin is a greenish/blueish colour. not quite aqua, but close to it. well, slapping them isn't working, and i don't know what else to do to get them away from. and i can't do much else anyway, because i'm sure the emus are a protected species. i think slapping them is my only choice. i can't attack them with sticks. i don't want to harm them, i just want them, away from me, to leave me alone so i can get home, in one piece. and bella has long gone, which means i have gotten her out of my mind. 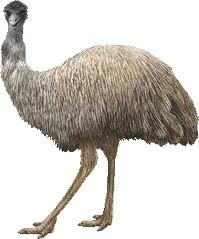 the dream ends while i keep slapping the emus. I know what the seat/chair looks like .. but don't know the "technical" name for it ..
Re: Seat/Chair, Bella, And 3 Emus ..
What is unique to emus? And you mean your car seat was sitting outside at the servo? You need to keep the emus away from you, yet apparently protect what they represent. The date Bella said, 21, has two before one. To drive legs out the other side is thinking of the passenger. You and her romantically walk into the sunset - well toward there - until losing sight of her and the other birds come. 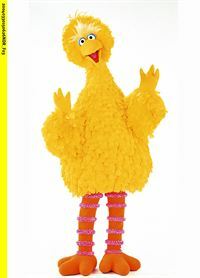 Only when the third Big Bird - sorry - arrived, did you mention slapping the beak which birdies talk with, rather than nose which is sense at a distance. You walked rather than drove your seat out to the dreaded Goonoo Goonoo town in the dark. Is the seat/chair a bucket seat? Or ejector seat? emus can't fly .. thats what unique to them .. that i know of ..
i need to find the seat .. to be able to submit a picture of it ..
until then .. the comments will continue ..
i don't know about "romantically" but yeah ok ..
my car was parked on the driveway of the servo .. I have found the chair ..
anyone know what kind of chair it is ?? ?